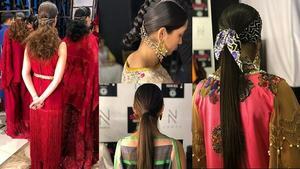 LAHORE After the success of the Fashion Pakistan Week held late last year in Karachi, the Pakistan Fashion Design Council (PFDC) started its first fashion week in Lahore on Tuesday. The event was held under tight security at a venue not advertised due to security reasons. Those present at the event included film actor Shaan, actresses Juggan Kazim and Iffat Omar, VJ Anoushey Ashraf, designers Ammar Belal, Maria B, Kamiar Rokni, Hassan Shehryar Yasin, Sadaf Malaterre, stylist Tariq Amin and head of the council Sehyr Saigol among others. The week aims at commercialising the fashion industry of Pakistan and promoting local craftsmen and embroidery. The event began with a performance by Overload with their lead singer Meesha Rehman. The designer duo Nickie Nina opened the show with their collection inspired by Swati embroidery and design. The common theme in their clothes was grey and white embroidery on colourful garments. Actress Nadia Jamil was the final celebrity that walked the ramp for Nickie Nina. Karachi-based Nida Azwer was the second designer to show her collection. Her work is inspired by the Tree of Life and traditional South Asian culture. Her outfits carried her signature long tunics. She also showed the garments embellished and in deep green. Whereas most of their collection was composed of eastern-wear garments, she showed two dresses on the ramp bejeweled from the neckline and split out in pleats creating a long flow as the models walked down the ramp. Several of her models walked the ramp with several children from the SOS village wearing her designer-wear as well. The models that accompanied the children included the likes of Vaneeza Ahmed, Sanam Saeed and Meesha Rehman. Islamabad-based Khadija Shah was the next to show her collection. She designs under the label of Elan and her collection started off with deep bottle green outfits. Her collection exhibited the silk-screen printing of various faces on her clothes - some of which carried characteristics of people from the Mughal era. Asifa and Nabeel were the fourth designers to showcase their collection. Sticking to the predominant trends of keeping their shirt in A-line form and the lengths long and they paired their clothes with long, loose pants. They also showed a three-toned dress which was white, orange and red. They also showed a red kaftan in their collection. Their overall work was sleek, lightly embellished and carried a fluid sophistication. Hadiqa Kiyani was the celebrity show-stopped for Asifa and Nabeel. 'Colour me Sublime' was the title of Sara Shahid's collection which had a light, airy fun about it and was heavy on prints. Three models Nadya Hussain, Fayezah Ansari and Mehreen Syed opened the show for Sara Shahid. She also opened the show with A-line tunics and lose pants often shifting between having a print on the pants and single blocked colour for the tunic and vice versa. The predominant colours of her collection were turquoise and purple. TV presenter Ayesha Alam also walked the ramp for her. A young graduate, Ali Zeeshan showed his collection at the fashion week. His collection, inspired by “hunters' hooves” and women in the courtyard of “days of yore” was a heavy styled one. Models wore everything from large colourful turbans, feathers on their head-gear, large colourful shawls, heavily-accessorised bags, bells and even chai kettles. The styling was a mish mash of elements picked up from the Mughal and pre-Mughal era. His collection was visually stimulating; however, it showed very little of the clothes themselves. Stylist Shahzad Raza was seen as the personality who walked the final outfit on the ramp for him. Karachi-based Yousuf Bashir Quraishi showed his collection, titled Holey, inspired by both 'Holy' and 'Holi'. A curious feature of his show was that the models held their hands together in the Namaste position at the end of the ramp. His collection consisted of bold colours with almost no prints and had everything from dhoti to draped-stitched loose shirts. Stylist Tariq Amin did the final honours on the ramp for him. Iman Ahmed from The Body Focus Museum closed the evening with her monotone collection which carried her mark and tendency to create flowing, yet flattering garments and had various symbols printed on the outfits as well. From handkerchief hemlines to draped skirts to belted ensembles, her collection received a standing ovation and was a visual treat. She was by far the best designer to show that evening and therefore the event concluded on a high note. The fashion event will continue for three more days.